A New Map of Michigan with its Canals, Roads and Distances. 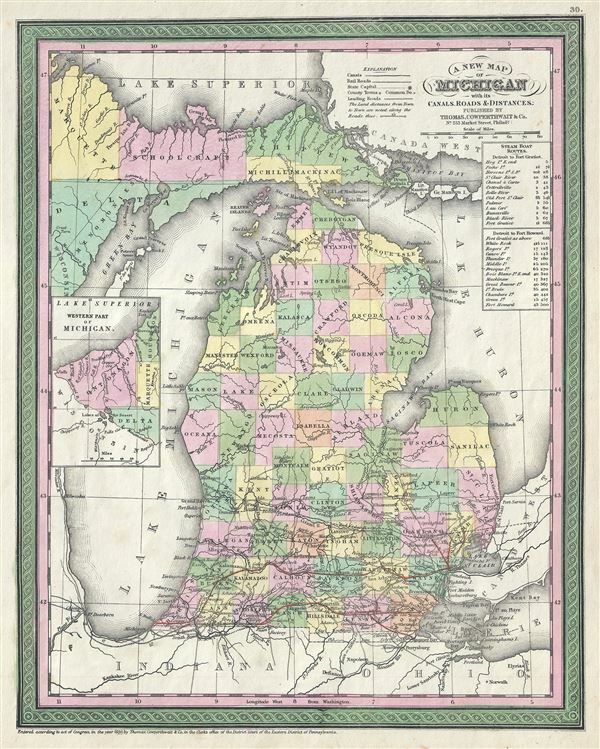 This is a fine example of Thomas Cowperthwait and S. A. Mitchell's 1854 map of Michigan. The whole is engraved and colored in Mitchell's distinctive style with green border work and vivid pastels. Political and topographical features are noted and color coded with elevation rendered by hachure. An inset at right center details western Michigan, specifically Ontonagon, Delta, Marquette, and Houghton counties. Along the right border Steam Boat routes with distances are presented in tabular format. Rumsey 0537.030 (1846 edition). Phillips (Atlases) 814.